Rachel was born and raised in Decatur, IL. She graduated from Maroa-Forsyth High School in 2008 and from there journeyed to Ames, Iowa to attend The Iowa State University. While at Iowa State, Rachel was a member of the ISU Women’s Volleyball team where she served as a team captain and All-Big 12 performer. 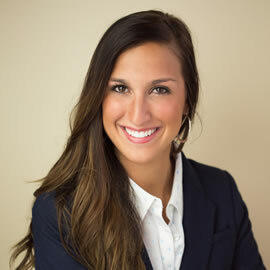 She graduated from Iowa State in 2012 with a degree in business marketing. Upon graduation, Rachel married her husband Tyler and took up residence in Central Iowa where they have lived ever since. They have two boys, and are hoping to continue growing their family in the years to come. Rachel thoroughly enjoys building relationships with the people of Central Iowa and is thankful for the opportunity to service their health and life insurance needs. She counts it a blessing to be a part of the Sams/Hockaday team!